ments. On hearing of the plot to crush us she resolved to apprise me of our peril and sent her faithful black man with the message. But Ewell's pickets would not let him pass, and he came back to his mistress. Then with a woman's ready tact, Mrs. Pendleton decided to send her son, Nathaniel, 10 years old, to warn me. She gave the lad a small basket and told him to say to the guards that he was going out to pick blackberries. The pickets patted him on the head and let him through, telling him to watch out for snakes and Yankees, and not to forget to come home. It was but half a mile to the Federal line, and here little Nat told the officer in command that he wanted to see General Kelley, but no amount of quizzing could draw from the lad what his errand was. Finally the officer took the boy on his horse and carried him to Headquarters. I was alone. When the picket officer retired the bright little fellow told me that I was going to be killed. I was naturally surprised at this abrupt and startling information. I asked the lad how he knew it. The boy replied, archly, that he knew it because his mama said so. Then with returning self possession he remembered more of his message, and he told me sententiously that all the Yankees were going to be killed too! My surprise gave way to amusement. I thought I had found a funny case in the youngster. I took the prattling child on my knee and coddled him a little and then asked him sportingly when these awful things were going to happen. 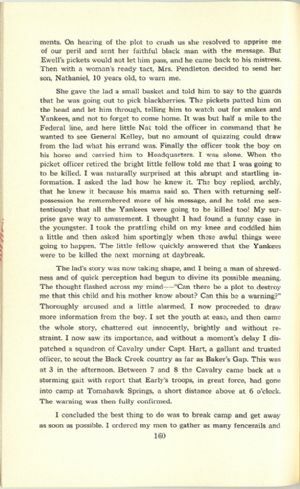 The little fellow quickly answered that the Yankees were to be killed the next morning at daybreak. The lad's story was now taking shape, and I being a man of shrewdness and of quick perception had begun to divine its possible meaning. The thought flashed across my mind--"Can there be a plot to destroy me that this child and his mother know about? Can this be a warning?" Thoroughly aroused and a little alarmed, I now proceeded to draw more information from the boy. I set the youth at ease, and then came the whole story, chattered out innocently, brightly and without restraint. I now saw its importance, and without a moment's delay I dispatched a squadron of Cavalry under Capt. Hart, a gallant and trusted officer, to scout the Back Creek country as far as Baker's Gap. This was at 3 in the afternoon. Between 7 and 8 the Cavalry came back at a storming gait with report that Early's troops, in great force, had gone into camp at Tomahawk Springs, a short distance above at 6 o'clock. The warning was then fully confirmed.